Forest Lakes Condos: V.2828 - Beautifully renovated end unit with 1 car garage! Lush, private garden views! Ideal Naples location! All new flooring with tile throughout the living areas, and carpet in the bedrooms. Kitchen has new stainless steel appliances, cabinets, granite countertops, backsplash and recessed lighting. Completely new Guest bathroom, while the Master bath is comfortably updated. An amazing sunlit Florida room offers a tranquil haven. Close to the beach, restaurants and shopping, this social 55+ community has three heated pools, tennis courts, shuffleboard and optional golf at the Quail Run Golf Club. Forest Lakes Condos: LIVE ON GOLF COURSE WITHOUT THE FEES & WITH A PERFECT VIEW OF THE 9TH HOLE!!! Active Community offering 3 Pools, Tennis, Shuffleboard, Bingo, and Bridge! This Rarely available End Unit Villa has 2 Bedrooms/2 Baths, a Large Family Room and an Outdoor Patio area overlooking a picturesque Lake with Water Feature and Golf Views! This Home comes complete with a newer roof replaced in 2015, the A/C systems and Water Heater were also replaced about 2 years ago, and clear Hurricane Shutters are on Premises along with a 2nd Refrigerator/Freezer in garage! The flooring in the Family Room has been raised to match other flooring and kitchen and Family Room Flooring has been updated with Large, neutral colored tile on the Diagonal. This 55+ Community is Centrally Located and close to shopping, Dining and The Beaches! No need for a car here! Community is about 2 miles away from Clam Pass Beach and The Waterside Shops, and has a back entrance to the Pine Ridge Crossings Center which includes a Publix, Target, Coffee Shops and Restaurants, also within Walking Distance to a Banking institution! Fairways At Emerald Green Forest Lakes Condos: Relax and enjoy beautiful sunsets and serene golf course views from the privacy of your own balcony and screened in lanai every day!! Building is located across from the community pool & spa and the BBQ area. A 1-car-garage (included in list price) for unit 308 is located right next to the building to the right. Other amenities include Tennis and pickle ball courts. The Fairways at Emerald Greens is located less than 3 miles from the beach. Walk to Publix, Target, fine dining and more. New roofs in 2015, parking lots resurfaced in 2016, buildings repainted 10/2017, new pavers by the pool 1/ 2018. Quail Run Golf Club memberships are available but not mandatory. A-rated school district. Fairways At Emerald Green Forest Lakes Condos: Renovated in 2016, second-floor condo on two levels. This 2 bedrooms/3 baths condo is sold turnkey and comes with a *GARAGE*. New kitchen with stainless steel appliances, new furniture, AC, water heater, washer, and dryer have been changed, electric shutters on the downstairs lanai et upstairs balcony. New garage door motor system has been installed. Laundry in residence. High ceiling throughout the unit (mainly 2nd floor). Two master suits on the second floor. Steps away from the pool, clubhouse and grilling area. Fairways at Emerald Greens is located in the Forest Lake neighborhood on Quail Run Golf. Golf membership is not mandatory. Two miles from the beach. Publix, Target, restaurants, Costco, banks and more are located close to the community. Miravista Forest Lakes Condos: Fully Furnished, turnkey - just bring your clothes and personal items! Perfect location and community to spend the winter in Naples or live here year-round! Extra Bonus Feature: Huge walk-in closet in the master bedroom and extra-large slider doors into the lanai from the living room. Enjoy the beautiful, peaceful and relaxing view of the Quail Run Golf Course from the living room, lanai and master bedroom. Split floor plan allows you to enjoy your privacy from your guests staying in the 2nd bedroom. Spacious kitchen with a breakfast bar over looking into the living room/dining room. Approximately 3 miles to Clam Pass Park & Beach, walk to Publix, Target, public transportation & more! Mira Vista has a heated pool. clubhouse, fitness room & elevators. Quail Run Golf Course memberships are available for purchase separately directly through Quail Run Golf Club. Fairways At Emerald Green Forest Lakes Condos: Great townhouse floor plan and it even has a garage! Located alongside a very quiet street, privacy above while still having a great view of the activity below. Light and bright throughout, with a half bath on the first floor, for living area convenience. New Water heater in 2016, fridge and washer replaced just after that. Tennis/pickle ball courts and bike storage located just across from you and the pool/clubhouse just steps from the stairs to the building. Fairways at Emerald Greens is an active yet serene community, located less than 3 miles from the beach. Walk to Publix, Target, restaurants and more. New roofs in 2015, parking lots resurfaced in 2016, buildings repainted October 2017, new pavers by the pool Jan of 2018 & new fence around pool May of 2018. Quail Run Golf Club memberships are available but not mandatory. Forest Lakes Condos: This beautiful 2 bedroom 2 bathroom condo has tile throughout the entire condo. Updated Kitchen, with quartz countertop makes this property light and bright. 55+ community, first floor unit, fantastic open view of the golf course and landscaped areas. Forest Lakes has very nice amenities with newly renovated pool areas Tennis courts and Shuffleboard. Access to the Quail Run Golf Course, membership not required. Fairways At Emerald Green Forest Lakes Condos: C.14961 - 26°12'9.85"N 81°46'36.05"W - At the Fairways you can live close to everything for next to nothing! Nestled in a preserve setting this unique two-story townhouse awaits you. Nicknamed “The Tree House” by the current owner of 20 years. Your private entry leads you into your comfortable retreat. Bamboo floors, vaulted ceilings, two master suites, a relaxing terrace and private balcony off the master are just a few features this home has to offer. Treetop views over a lush landscaped backdrop. Just minutes away from the beach, golf, tennis and shopping yet quietly tucked away. Neat as a pin and move in ready. One of the best values in all of Naples. This home won’t last long. Call for an appointment today! Miravista Forest Lakes Condos: Great Price, Great location, Great View. . This 2 bedroom/2bathroom fully furnished (turnkey) unit is located in the heart of Naples close to shops, restaurants and the beaches. Meticulously maintained with a magnificent golf course view from the living room and main bedroom. Watch golden sunsets from the spacious lanai with extra storage space. It's just steps to the pool. Enjoy the Clubhouse and keep fit in the Exercise room. Ideal purchase for escaping the harsh winters of up north or as a full time residence Pet friendly allowing one dog, 60ibs maximum. For golf lovers, membership of the Quail Run Golf Course is available. Paradise is truly found. Doral At Park Forest Forest Lakes Condos: In Move in condition! Just reduced!Sellers are motivated. Charming, west facing, golf course view, first floor Doral condo with many upgrades...Custom closets, new lighting, Hurricane Windows, new A/C, cork flooring throughout, Plantation Shutters, fresh paint and crown moulding. The newly remodeled bathrooms and granite kitchen help make this condo warm and inviting. New landscaping around the parking area and new car ports are being installed this spring. All assessments have already been paid. Washer dryer in condo. Doral is convenient to the best of shopping and dining in Naples. Seagate beach, Artis Naples and The Waterside Shops are only 5 minutes away . A great choice for golfers with Quail Run Golf Club in your backyard. Memberships are available but not necessary.Good potential rental income as well. Agents, do not miss showing this two bedroom gem. Priced to sell. Forest Lakes Condos: Lovely 55+ community, 2 miles from beach and convenient to shopping and dining. Light and bright desirable end unit on second floor with a Golf course View. Golf course membership NOT required. Location is peaceful and quiet on end of street with no through traffic. Community has 3 newly renovated pools, clubhouse, 2 tennis courts and shuffleboard. Internet and cable are included in Condo Fees. Condo is offered Turnkey, Water Heater and Carpet replaced in 2015. Forest Lakes Condos: Exceptional views and a fantastic Naples value, this two bedroom, two bath is the one to see! Remodeled with new windows, tile floors, new appliances and an excellent Central Naples location. Convenient first-floor access, a great place to call home for the winter or year round. The residence has beautiful interiors, lovingly cared for and is turnkey ready for your immediate use. Forest Lakes is a friendly 55+ community with a clubhouse, three swimming pools, tennis and just minutes from the beach and shopping. Overlooking Quail Run Golf Course where golfing and social memberships are available but not required. Perfect for seasonal, full-time use or as an investment opportunity. Sunny eastern exposure with long golf course views so this residence is bright and cheerful. Forest Lakes Condos: C.16007 - Wonderful opportunity to enjoy paradise in this lovely 2bedroom/2bath N Naples condo. Light end unit featuring an open floor plan with serene golf course views from a beautiful screened in lanai. Eat in kitchen offers newer appliances, a spacious master suite with 2 closets and shower while the 2nd bedroom offers a great office space with a murphy-bed. Forest Lakes, a 55+ Community sits on 17 1/2 acres of beautifully landscaped grounds boasting 3 heated pools, clubhouse and tennis. Convenient location, just 2 miles to pristine Naples beaches and walking distance to shopping at Publix, Target and excellent local restaurants. Perfect for seasonal, full-time or investor as home has been freshly painted and waiting for its new owners. Come and experience the beauty of this fabulous community. Note: Membership to Quail Run Golf Club is available but not mandatory. Forest Lakes Condos: BACK ON THE MARKET AS OF APRIL 1, 2019! ADVISE YOUR MOTIVATED BUYERS! Seller withdrew listing for Jan, Feb & Mar as had renter in place. NOW IS THE TIME TO BUY! LOCATION! VALUE! SUNSHINE! AWESOME VIEWS OF THE QUAIL RUN GOLF COURSE AND LAKE from this top floor Capri Deluxe 2 bedroom 2 bath condo (Turnkey) at Popular Forest Lakes, an Active 55+ community! Bright and Cheery Corner end unit boasts a newer kitchen with Silestone counter top, white cottage panel cabinets and white appliances. Area in Kitchen can be used as a "breakfast area" or add additional cabinets. New lanai screen installed and lanai painted week of 12/5/18. Decorative Tile on Lanai. Great Storage with Storage Closet on Lanai as well as assigned storage space on the first floor. Assigned Parking. Condo has been lightly used by family couple weeks per year. Wonderful amenities offered at Forest Lakes, including 3 heated newly refurbished pools, Clubhouse, Tennis Courts, Shuffleboard, tons of open space for walking and biking, Optional Non-Equity Golf and Social Memberships available at Quail Run Golf Club. 10 minutes to Clam Pass beach, and easy access to all of Naples' great dining, shopping and superb amenities. Forest Lakes Condos: RENOVATION COMPLETE AND BACK ON MARKET! This condo has been dramatically improved from the prior condition. New Granite with under mount sink. Renovated cabinetry in the Kitchen, new second bathroom vanity, renovated second bedroom with all new paint and carpet and MORE! Check out the photos to see this totally move in condo for a super price in Naples! This is a 55 and over community and one of the occupant/owners must be 55 and over. Across the walkway is your laundry and storage room which is very convenient for use instead of having to take an elevator to get to things. Also, includes a covered parking spot. The building is right across the road from a very nice community pool and tennis courts. 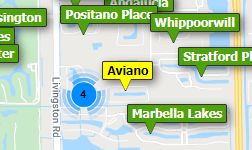 Forest Lakes is a super location in Naples close to everything that Naples provides. Live in Paradise for a fraction of the median housing price for Naples, Florida. This is a must see. Forest Lakes Condos: Spectacular 2 bedroom 2 bath condo in the heart of Naples! The kitchen features upgraded white cabinets, newer refrigerator, breakfast bar and pendant lighting. Living area is perfect for entertaining with the comfortable furniture included. Split bedroom design offers privacy for guests. Forest Lakes is an active 55+ community with many amenities including tennis courts, bocce and new pools and low fees! Additional features include a newer A/C unit, pull down shutters on the lanai and a covered parking space. Perfect location to beautiful white beaches, exquisite dining and upscale shopping! Don't miss out on this opportunity! Forest Lakes Condos: New to Market, Cozy 2-bedroom, 2-bath, partially furnished, third floor condo in Forest Lakes. Clean with newer appliances, tiled kitchen, carpet in living room and bedrooms, tiled lanai which overlooks manicured landscape setting, separate laundry facilities on each floor, common elevator and detached car port. Forest Lakes is an active 55+ community with three community pools, tennis courts, clubhouse, and more. Forest Lakes is centrally located to Shopping, Restaurants, Beaches and with easy access to I-75 and Downtown Naples. Surrounded by the Quail Run Golf Course, Golf Membership is NOT required. Quail Run Golf Course does offer different memberships to those desiring to play. Forest Lakes offers Low HOA fees with Cable & Internet included in the Fees. Forest Lakes Condominium Assocation Rules and Regulations DO NOT allow pets in this community. There is a One Year Home Warranty on appliances and mechanicals being offered at closing. This property is priced to sell, schedule your appointment NOW, you will not be disappointed. Professional Photo’s coming soon. Forest Lakes Condos: C.15559 - Brand new Rooms to Go Furniture!You simply can not find a better value 4 miles from the beach. Extremely close to Target, Bed Bath and Beyond, Publix, Waterside Shops and a multitude of restaurants. Brand new paint and carpet. Granite countertops in kitchen. Serene golf course views. Forest Lakes is an active 55+ community with access to golf, tennis and swimming. Forest Lakes Condos: C.16138 - Looking for value? Perfect opportunity (and price) to purchase a golf course condo in an excellent Central Naples location convenient to shopping, casual and fine dining and just minutes to the beach. Located on the Quail Run golf course(membership is optional)in an active 55+ community, this condo provides top floor views, two bedrooms and two baths, spacious living & dining area, screened lanai and impact windows. The master bath has a separate dressing area and a large walk-in closet. Community amenities include a clubhouse, tennis and shuffleboard courts and 3 heated pools. Forest Lakes is popular with both seasonal visitors and year-round residents. This condo ready for you to update for your perfect Florida lifestyle! Agents see confidential remarks.